I started the spring shed-hunting season hoping to find one set of sheds in particular – and no they weren’t from a 165” giant we’d been passing all year hoping he’d crack the Boone and Crocket barrier next season. This aint Iowa, and my name isn’t Lakosky. The deer whose antlers I coveted was a 2.5-year old 9-pointer, who frequented my Moultrie all winter long. The 9-point buck Johnston awaited to drop sheds. I religiously checked my camera waiting for this particular buck to show up missing antlers. In early February I got the photo I’d been waiting for. The buck I’d dubbed ‘Survivor’ showed up with his right side missing and a few hours later returned with no antlers at all. 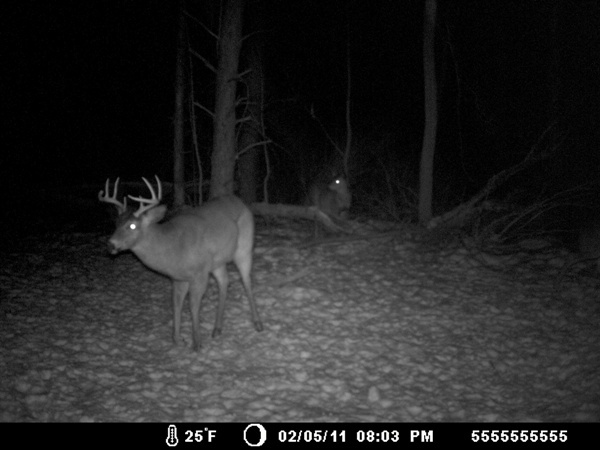 In late February I set out hoping to stumble upon these two antlers. I made three different trips to the woods in February, but had no luck locating Survivor’s sheds in the thick white snow. My luck changed in March, though, when the snow pack melted and I was able to locate both sides of Survivor. The antlers lay approximately 25-feet apart in a travel corridor. This was a major accomplishment for me as this was the first match set of antlers I’d ever been able to recover. 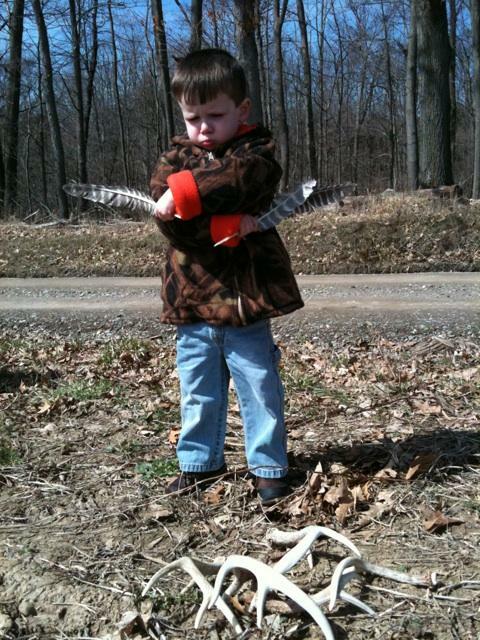 Feeling more confident in my shed hunting ability, I took my 3-year old son a few weeks later to another family property. With Blake in the backpack, and my wife and daughter at the mall, we set off in hunt of more bone. For anyone with young children, this is a great way to get them involved in the great outdoors – and another opportunity to get you to the woods. Blake seemed to really enjoy the day and even claimed he saw a zebra at one point. Not sure on that one. We were about a half an hour into our quest when I spotted antlers through the woods. I pointed them out to Blake who replied, “They’re from a white buck Dad.” He could obviously see the white of the antlers through the trees. 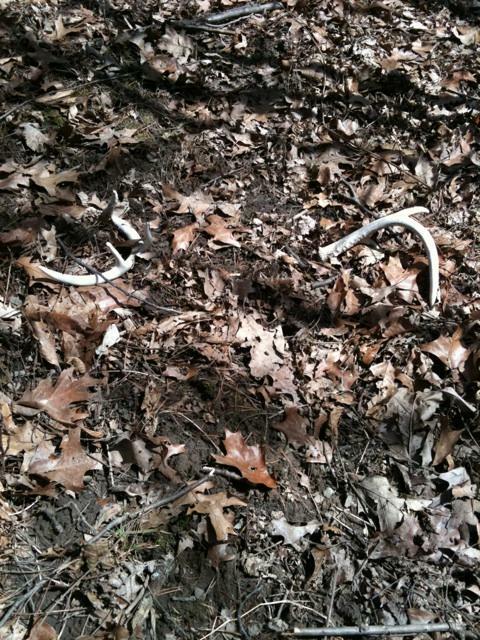 As it turned out there were two antlers and they too were a match set of sheds. Blake looking tired after a day in the woods! 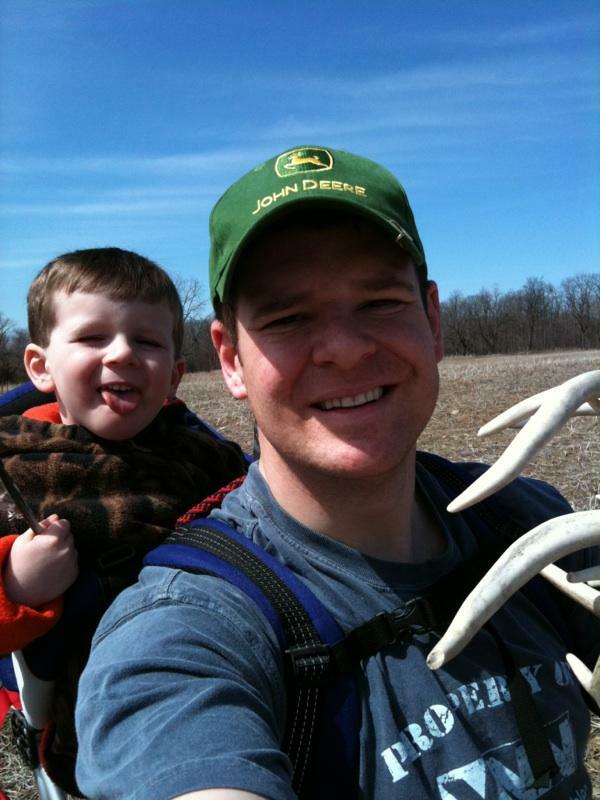 With two antlers in hand, Blake and I continued our walk where we found four more antlers. Nothing huge, but still satisfying – especially sharing it with my little guy who with any luck will roam those woods for years to come. The walk back to the truck nearly broke my back, as the 35-pound kiddo was getting heavy after our long journey. He posed for some pictures, but fatigue had apparently caught up him too! The shed season turned out to be an entire success. I substantially added to my shed collection and, more importantly, made some quality memories with my favorite little guy – memories that even a 165” deer can’t compare to. Writer’s Note: I started this post several days ago. I’ve wanted to help a buddy out by sending a few votes his way. Why? Because he’s helped me out a ton over the last few years. Not only by allowing me to see so many of his shows, but by simply writing and recording some of the most powerful music that speaks to this country boy’s soul. I started writing the post to help ease my mind when my dad was headed into open-heart surgery. I had to stop in the middle because things weren’t going so smoothly. Several Eric Church songs have been on my mind since as my pops has been showing he’s country tough. And things are starting to look a little better. Yet again, Church is helping me through some stuff. Being up for ACM Top New Artist almost makes me laugh – mostly because he’s been stomping the dust out of gymnasiums, then honkytonks and some good-sized sports arenas for several years. And anyone who has stood witness to one of his shows will tell you, Eric Church has been at the top for a while. Nonetheless, it’s absolutely awesome to see him finally getting recognized by the country music industry. He doesn’t stick to their rules very well, but he never planned to. 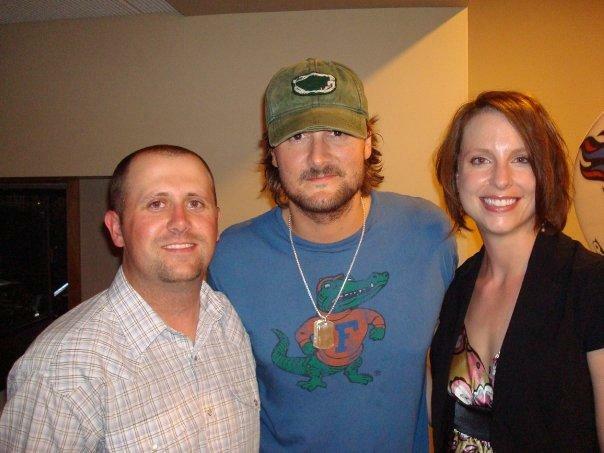 Erin and me with Eric in Nashville in 2007. Don't let the UF shirt scare you, he's ACC country! How can you not respect that? Even before his first song dropped in the hands of a program director at some C-county country radio station, he knew he was going to make it – or break it – by doing things his way. I first met Eric roughly five years ago when he was in Charlotte playing a honkytonk. I was invited by two new friends who I’d met in the country music industry to join them backstage for that show. They worked at Capitol Records Nashville and I’d dropped boulder-sized hints that I sure would like to go. I’d heard a few of Eric’s tunes, but the songs “Guys Like Me” and “Sinners Like Me” were very high in rotation on my iPod at the time. It took all of two minutes of hanging out with Eric for my wife and me, and my buddy Brad who joined us that night, to realize that he was “the man”! His family treated us like kings and we shared more laughs about life in an hour than I’d done in quite some time. Fast forward almost 20 live shows later (and a few chart-topping songs that still yank at either my heart chords or my hillbilly roots) and he’s still the same basketball-loving Carolina boy we met that night. We have an embarrassingly large number of group photos with Eric. As you might imagine, I’m still a pretty big ambassador. Most of my friends and co-workers get annoyed at my constant urging for them to join the bandwagon. I’m not embellishing when I tell you that the conversion from trial rate is dang-near 100 percent! If you’ve not listened to his music, you’re missing something amazing. If you’ve not seen him live in concert, it’s way worse than that. You must add it to the bucket list. And I don’t even care if you like country music or not. He can make a crowd go absolutely bonkers with more boots in the air and “cold, cold beer” being raised than you can count in an evening. Well, since this is an outdoors blog, I have to tell you that he also likes to fish. And he’s shown me pictures of a damn-nice 9-point buck hanging out in his backyard! There. This post still fits (sorta like, “These boots”)!